Considering how hands-down fabulous Birdo is and always has been, it sure is a shame how shabbily Nintendo has treated her over the years. Thankfully, Twitter user Markatansky decided to go ahead and do what the folks at Nintendo surely are unwilling to do at this point--which is declare this the "Year of Birdo." Yes, that flies directly in the face of my own campaign that's centered around this being the "Year of the GameBoy," but I'm OK with that--especially since the focal point of Markatansky's effort is the awesome t-shirt that can be seen on the right. It's still possible to nab one or more of these hot-pink tees, by the way--or at least I think it is. As far as I can tell, should enough people go to teespring.com, click on the "I still want this!" button in the lower-right corner and proceed to place a pre-order (as I did a week or so ago), Markatansky's design will be offered up for sale once again. 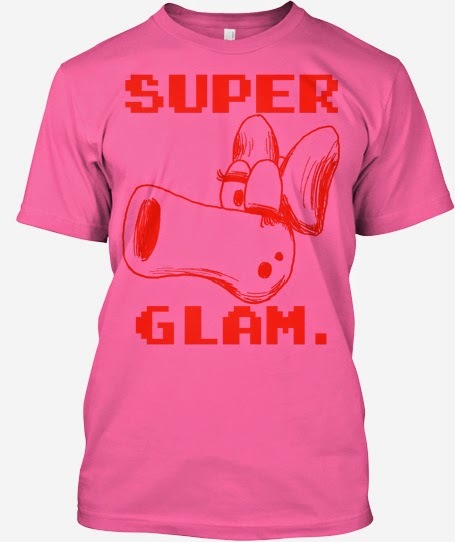 So, what are all of you "super glam" Birdo fans waiting for? Maaaaan... you know what would have been brilliant? A Phanto-level in 3D World (or any of the new 4-player ones) where you'd have to carry a key to the end, and you could play "Keep Away" with it, throwing it from one player to another. Also I was really surprised that Birdo isn't in MK8. On a similar note: I'm really, really hoping Nintendo eventually releases a 3D Mario game that utilizes some of the features and aspects of SMB2/USA. Or even a 2D Mario game. Why has the company avoided doing this for so long, I wonder? Finally, yes, I also think it's sad Birdo is missing from Mario Kart 8. Maybe she'll be added as DLC sometime soon? I hope Birdo turns up! MK8 is one game where I am really looking forward to some DLC. I mainly want more tracks (even just more "retro" courses would be fine) but there's definitely some characters I'd like to add to my roster, too. I have a feeling Nintendo is prepping Mario Kart 8 DLC as we speak, so hopefully we'll hear about it soon. And, yes, it would be great if this DLC covered both tracks and characters!